“May the Almighty Yahweh, continue to Bless you both – now and always!” D.V. This is added – just for Mr. Wonderful, himself! 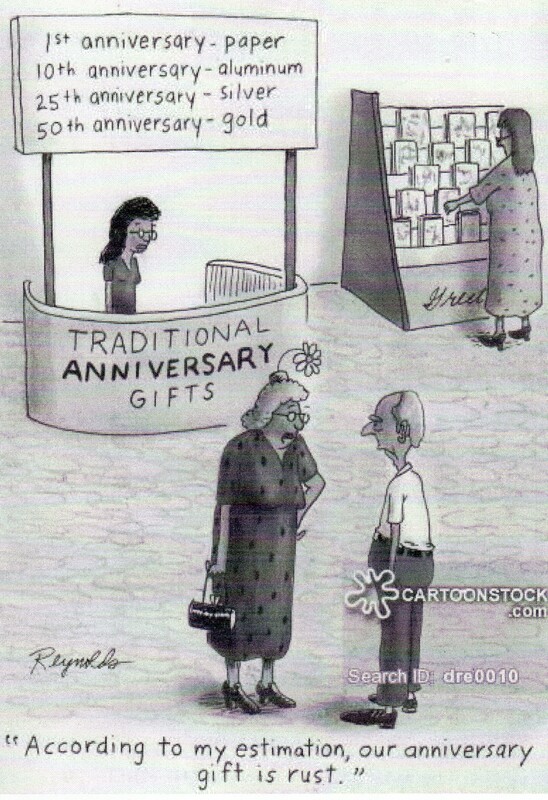 So appropriate for an old steel salesman! “How’s the “AIR” up there?” That sure was a surprise to little “Al” to be put up there – above all of us – and he could be calling for HELP! A new name, “Cape Kennedy” a change from the previous and so well known “Cape Canaveral”, Florida, 32953 – only happened – after “President Kennedy” was assassinated, so that, we AMERICANS would have a remembrance of what he stood for “Space Flight” and also, that all of us “AMERICANS” will just have a plan to see and visit – as we were planning to do, while on our way to Merrit Island to visit cousin, Jimmie Brady Shilling. I remember , as if, it were just yesterday, a slow and enjoyable vacation, driving up the Florida Highway coast and just far enough away from home, Fort Lauderdale, and stopping for breakfast. We started our day nice and early, just so we could stop at a restaurant, other than our own – and enjoy meals prepared without our help. We were planning on staying a full week and enjoying the swimming at Jimmy’s place on Merrit Island. They had spent sometime at our home in Fort Lauderdale – and said to come up, to their place and plan on doing some nice sight-seeing. 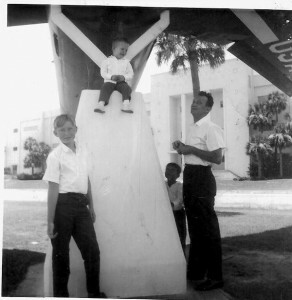 That is Al Aldrich , sitting at the top of the base for the AIR CRAFT , just above his head as little Al is near or just 2 years of age. Al had already made a “solo trip” from Fort Lauderdale, Florida to St.Louis, MO via Eastern Air Lines, at the age of “eighteen” months. 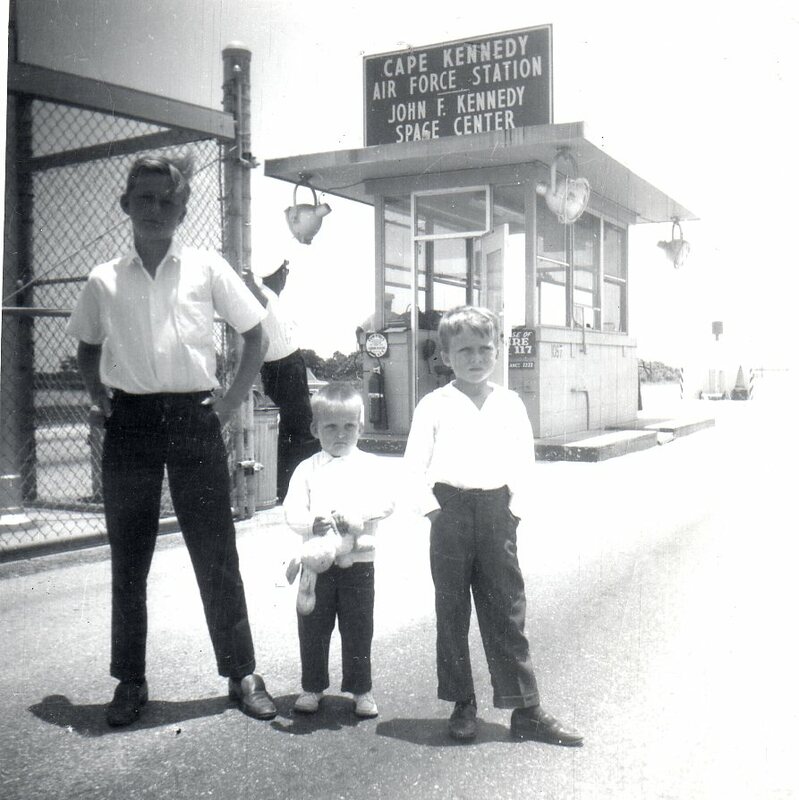 He is now a licensed pilot today, and Helicopters being his favorite way to fly, and I have often wonder, did little “AL” like sitting up there and did that trip to Merrit Island inspire him, to learn to fly? Posted in Family, Grandma and tagged "Mickey McLaren" -" herself"with no comments yet. This is baby ALYSSA and she is almost 10 months old. 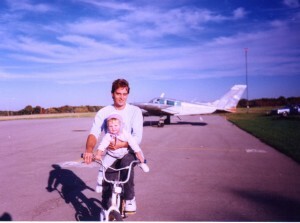 Looks like DADDY is taking little ALYSSA for a perimeter – check ride around the AIRPORT – on his bike. The weather is so much better as each day comes and goes – so, NOW is the day to take that FREE AIRPLANE RIDE with ME today. When you take the time and go flying – you will find that you will soon want to take lessons – and make TIME to be at the AIRPORT – every good chance, that you can – just to know that you will be able to FLY up and over your home and all the little homes – that you will see below – and the people will look like little “ants” if you get to see – someone looking up into those nice blue skies and wishing, that they were up there – with you and learning to FLY, too – as it is just great, to be up in those big beautiful shades of powder blue sky – it makes you feel like you are NOW , in a most wonderful world enjoying those DREAMS – that you made to yourself – to FLY– in the one place above all others, that you always want to be in – because it is all – pure enjoyment! “TIMES a flying by – COME and FLY with ME!” – we always welcome, your company, when it comes to FLYING with… “DADDY and ME!” D.V. 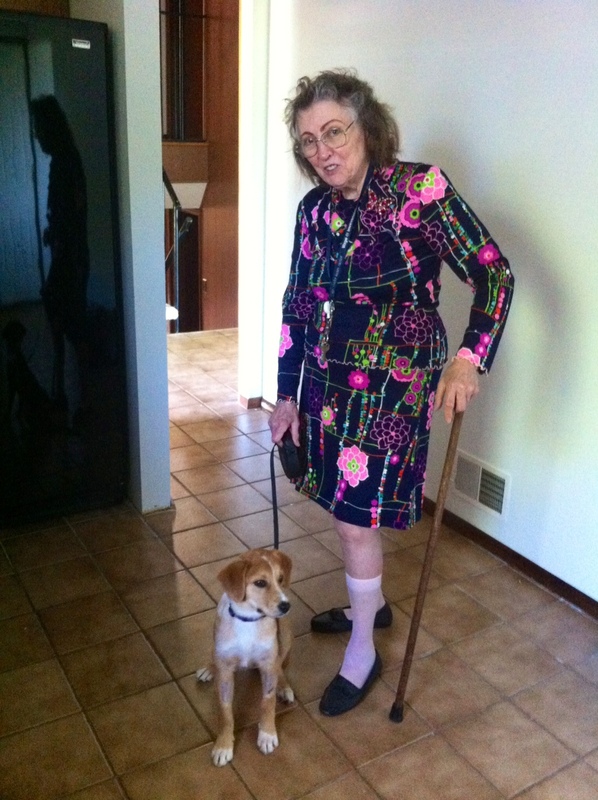 Sure is good to have a “cane” to help – something to lean on and this particular “cane” did belong to my husband, Lee – as he also had his fair share of surgeries after having been shot – when on the Police Department – some fifty + and, or more years ago. Good to hold on to those old “CANES” – never know when you just, may need one? “Just have to THANK our Almighty Yahweh, because He gave us these wonderful , loving animals – to give their LOVE to us, humans – for the healing purpose – so that we will also care for them as they care for us – sharing the LOVE, that only our wonderful CREATOR can give – to all of HIS creations – now and forever!” D.V.